Welcome, children of the night! This Blog is for fans of vintage horror films as well as those who are just beginning to discover the joy of these classic movies. I'd love to hear from you! If you're looking for horror, this is not it. Ghosts on the Loose is a low budget Banner Production, distributed by Monogram Pictures that's a vehicle for the comedy of The East Side Kids. Although both Bela Lugosi [Dracula] and Ava Gardner [Night of the Iguana] receive top billing on most movie posters, they have very little screen time. 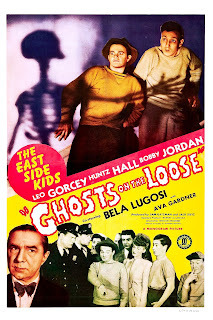 I watched this film because of Lugosi's fun performance in Spooks Run Wild (1941) which I highly recommend. But, alas, Ghosts on the Loose does not compare to his work in the other film. In this film he plays it straight and serious and only has a few lines here and there. It was disappointing to say the least. This is not to say that Ghosts on the Loose was a bad film, but there's nothing paranormal going on here. It's a little "let's get the Nazis" meets "wedding of a friend" kind of film. If that's your thing, then you'll enjoy it. If you're looking for Lugosi to deliver the goods, then look elsewhere. For more info check out the film's entry in IMDB. Do you remember a time when CGI didn't exist and vampires didn't sparkle? Ah, those were the days! Excellent = A classic. Everyone should see it. Very Good = Nicely done. Well worth your time. Good = A solid effort but nothing special. Fair = A little weak. Not so good. Bad = Don't waste a single brain cell watching this red hot mess of a film.